Badrinath is on a look out for a typical and bride falls for Vaidehi, a very ambitious girl with goals and dreams. 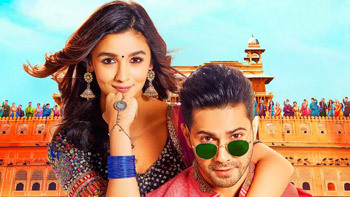 One line Review: Badrinath Ki Dulhania has an extremely entertaining narrative that renders a powerful message through its winning plot! Positive Points: Out of the box storyline which is fresh, youthful and executed in a manner that it is supremely entertaining to watch. Excellent performances, and an extremely powerful plot. Hats off to the makers for handling such a sensitive subject appropriately while rendering a very important message. Varun Dhawan: I was signed for October even before Badrinath Ki Dulhania and Judwaa 2!